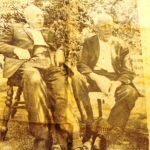 Bill and Joe Kendrick were my uncles and were from Taghmon, Co. Wexford in Ireland. There were five boys in the family, Samuel, William (Bill), Joseph (Joe), Ernest and my father, Bertie. Sam and Ernie had diabetes and didn't go to the war, and my father, born in 1904, was too young to serve. 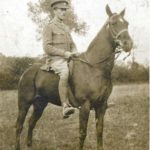 Bill joined a horse regiment during the war. He was gassed but survived and he survived the war, too. Joe was born on 7 July 1893. 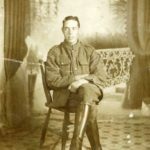 During the war he served in the Army Corps of Cyclists, 36th Division attached to the 10th Corps Cyclist Battalion. Joe was at the Somme, Ypres and we think in Flanders, too. He used to visit my family every Christmas but although I was interested in the war, Joe would never talk about it. 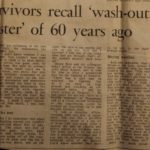 However, Joe did an interview for the Irish Times newspaper in July 1976 for the 60th anniversary of the Battle of the Somme and shared his memories: "I don't know whether I was afraid. You couldn't have time then to think or to have nerves. Our nerves was gone, sure, by that time. We were on ordinary push bikes, bikes you'd see in the street, you know. 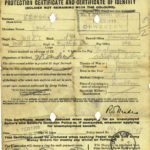 Our jobs were different: sometimes to go ahead and report on the German's movements and sometimes going behind the lines or then maybe carrying ammunition. We were meant to work together with the cavalry, them in the fields and us on the road. But there wasn't much cavalry at the Somme, I think, I can't remember all that much, I was only in my 20s…But I do remember that when the fighting started you couldn't be worried about fear or anything. The place was full of machine guns, rockets, hand bombs and terrible noise. Explosions going off all the time. I know we went over the top in a three-way move, one on the right, the 36th in the middle, and one on the left. How did I survive? I was one of the lucky ones that got through, that's all. My number mustn't have been up…The weather was melting, like now it was. And they couldn't get food to us, only our emergency rations. Terrible stuff: a tin of bully beef and a few hard biscuits." 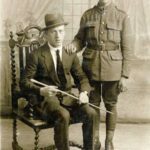 Joe was severely gassed in 1917 but he survived and was in France the day the war ended. 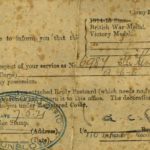 "All I remember is hearing the command to cease fire…and then the cafes and the pubs opened and we got some free beer." Joe worked in Clery's in Dublin once he had recovered from the war and spent over forty years as an employee there. He died in 1978 and is buried in St Munn's graveyard, Taghmon. 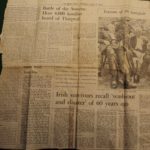 Photographs: Joseph Kendrick in uniform; Joseph and and his brother Ernie; Bill Kendrick on horse;formal regiment photo; informal regiment photo;Protection and Identity cert, Joseph; Demobilisation cert, Joseph; Notice of War Medals, Joseph; Certificate of Employment during the War, Joseph; Newspaper article, Irish Times, 1 July 1976; 'Veterans of the Battlefield', Joseph Kendrick and Henry Blee in 1976; Joe's memoir, from Irish Times article.